Liverpool: 242 artists in 27 locations for 72 days. Nottingham: 1000 artists in 37 locations for 10 days. Having been lucky enough to have attended both these major art events within the last few months, I feel that there are several comparisons to be made between the two. Maybe the Liverpool Biennial would be been a completely different experience had I been a exhibiting artist as I was for the World Event Young Artists (WEYA) in Nottingham, but both depended on the viewer or participant giving a lot of time, energy and dedication to seeing the ‘whole’ thing rather than just a snippet. I have heard first hand from the people who only managed a ‘snippet’ of both, and the story was not good. They felt that the promises made in advertisements and general hype around the event was far more than what it actually delivered. I can see how this can be true. 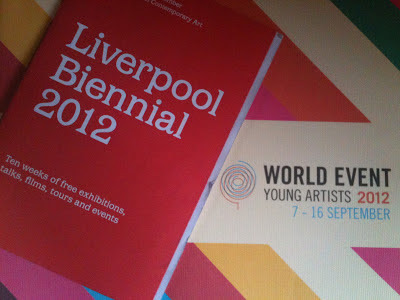 In order to fully appreciate the Biennial or the World Event you had to be prepared to immerse yourself in the art. Don your best walking shoes; make sure you packed a waterproof coat (and sun-cream – always living in hope); camera; event leaflet/guide; and some food… after all I am talking about long days here. Oh, and for me it helped if you took a friend along for the ride. It’s always great to have conversations about what you have just seen, whether it be positive, negative or indifferent. For the World Event Young Artists the organisers made sure the artists were in the city for the full 10 days of the festival. This certainly helped enrich our experience. There was nothing else to do except throw yourself into seeing and doing. Every morning was spent walking around the city intentionally searching for or stumbling upon venues hosting the visual art side of the event. I normally managed between 3 and 5 a day; so much depended on how close together in proximity the galleries or spaces were. In the afternoon workshops were programmed or a matinee of a performance was attended (musical/theatrical/other). The evening was spent eating with new friends made at the event and going to another performance (mainly at Lakeside Arts Centre, Nottingham Trent University or Market Square). The days certainly went quickly as they were action packed. Although we were all rather tired towards the end of the 10 days – everyone knew it was totally worth it. Liverpool Biennial opened on the last day of WEYA, meaning sadly I couldn’t get to the Biennial launch events (instead I was at the WEYA wrap party at Nottingham Contemporary – ah-hem). I did however; make the short un-arduous journey from Manchester to Liverpool once I got home form the World Event. One day is not enough to see a Biennial that is for sure. I went back for second day of Biennialing – and I really packed it in. Unfortunately I didn’t even touch on The Independents really – only making it to one: the Fallout Factory, which is a great little space that I intend to visit again. The guys running the space were friendly and enthusiastic about what they were planning, although I couldn’t help feel at only two months old, they had a lot to contend with and lots to learn still. Fallout Factory reminded me of Surface Gallery in Nottingham – very similar size space, run voluntarily and pretty central within the city. The use of interesting spaces and usually not accessible for the general public were used as venues in both. In Liverpool there was notably Liverpool John Moores University Copperas Hill Building (old Royal Mail sorting Office), The Cunard Building and The Munro which were exciting for me (as a nosy parker) to explore and encouraged me to think how I, as a site-specific installation artist, might make work and respond to that space. At the World Event I was charmed by Primary, an artist’s studio and gallery facility that has been transformed from an old primary school, as the name suggests. If I were a Nottingham-based artist I would crave a studio space there. It is THE most exciting space I have seen for a long time. Other studio’s were used as venues in the Biennial and World Event: The Royal Standard in Liverpool and Backlit and One Thoresby Street in Nottingham… All places where you could see there were artist communities and spaces available to make work of all scales. For these venues to be used in the two events seemed natural. As well as studios, bigger, more established gallery spaces were taken over by participating/selected artists. Conventional gallery spaces in Liverpool such as: Tate Liverpool, Walker Art Gallery, Victoria Gallery & Museum, The Bluecoat and FACT were used (some successfully, other less so – a nod to the Bluecoat here is necessary as there Biennial exhibition was a triumph). The Tate pulled out old pieces from their permanent collection much to my disappointment, for me this wasn’t in keeping with the ethos of the Biennial – of bringing new ideas, work and artists to the city. They surely have more budget than the artist-lead spaces to curate and develop a special exhibition – yet it was the smaller galleries that were pushing themselves and introducing us into international or lesser-know artists. Bravo to them. In Nottingham a slightly different story – every venue was taken over by WEYA artists – an eclectic mix of national and international artists with varying levels of craftsmanship, age and experience were all exhibited side-by-side. Nottingham’s best-known galleries were used, including: Bonington Gallery (where my work was), Lakeside Arts Centre (where Alana’s work was), New Art Exchange, Nottingham Castle and the Lace Market Gallery. The decision to exhibit our work in these type of venues made by the galleries and event organisers was refreshing, and allowed us as artists to be taken as seriously as other more prestigious names. I thoroughly enjoyed both and am glad I made the effort to attend. For both the World Event and Liverpool Biennial there was a real buzz created on social media and within my artistic circles. I am so glad that I gave both the time they deserved. As a participating artist in WEYA, I know how important it felt that people were making the effort to go search out your work in a city full of things to explore.